You’ve all probably seen word clouds, those designs that are made from a selection of words in a paragraph. There’s a free online program called Wordle that I use with my students on the first day of classes at Trinity as an introduction. I have them write a little bit about themselves, then transform it into a design. You just paste the words into the Wordle window, choose your colors and layout, click Create – and voila! 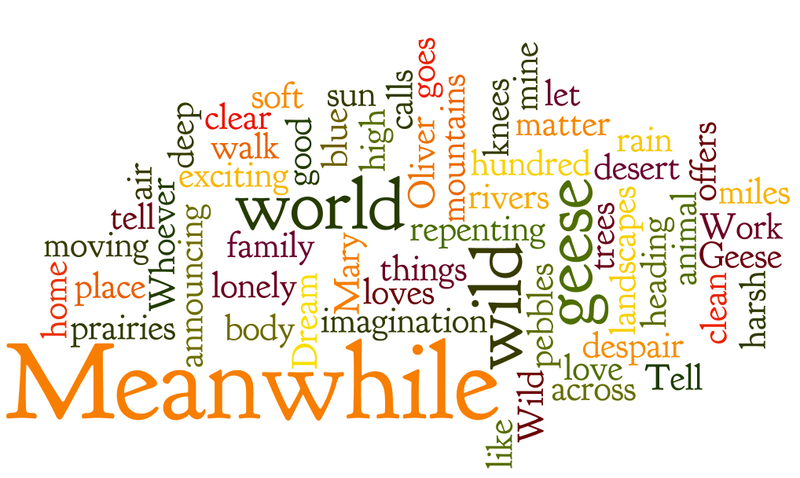 Here’s one of my favorite Mary Oliver poems, Wild Geese, as a Wordle word cloud (the poem itself is underneath the design). Give it a try, and have fun Wordle-ing! This entry was posted in easy project, How-to, Inspiration and tagged poetry, word cloud, wordel by lynbelisle. Bookmark the permalink.